By the time you get to my age there have been a lot of painting loves, I am very torn between long term affairs and current crushes. A few contenders: Duccio’s jewel bright comic strip of the Passion of Christ, Piero Della Francesca’s Miracle of the True Cross cycle, Hugo van der Goes Portinari Altarpiece. Duccio is a bit early for this project, but I’d love to make a film about that epic work in my fantasy life with no time constraints. The difficulty with Piero is picking one of the many paintings in the cycle, and if I’m honest the story surrounding the Portinari Altarpiece is what moves me about that painting as much as the painting itself. 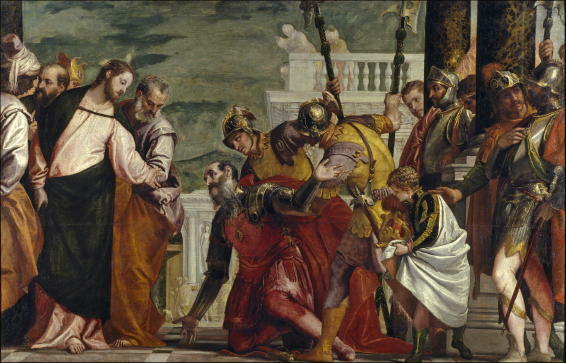 So to the current crush: Veronese. Its been a long time in the making. San Sebastiano Church in the Dosoduro in Venice was my first brush with Veronese in volume, but getting your head around the pictures there is difficult. Lying on the floor, or putting lira coins in the machine for a three minute glimpse at the Altarpiece is not ideal, although the surroundings are glorious and it is an essential pilgrimage for Veronese lovers. So to London’s National Gallery exhibition this spring where for the first time I was able to get the full house of this extraordinary painter shipped in from everywhere from the Met to The Prado. I couldn’t keep away, I knew his colour sense was good, but here was perfect pitch both chromatically and tonally time after time. His last ‘Venus, Mars and Cupid’ from Edinburgh has a passage of close toned footwork in the bottom left corner that made me cry more than once it is so exquisitely subtle. But I know I’m meant to chose a whole painting and not four intertwined feet so I’m plumping for ’Christ and the Centurion’, a mid career painting where his colour is still in full throttle before things became more somber and close toned in the last decade or so. For me this painting works on every level, as a human drama, as a dynamic composition contained within a rigorous architecture, as a painting reveling in saturated colour in the foreground drama, fading into the gloriously simply suggested far distant dog walk. The pathos of the grand old general falling to his knees to beg Christ’s attention and the surprise and consternation of his minions are perfectly realized both in the expressiveness of the faces and also in the whirligig of arms, fabrics, lances, and legs that culminate in the general’s pleading right hand. Veronese’s use of negative space always delights, there is never a dull moment in them: lances against background rhyme with the young boy’s striped sleeve, gorgeous crimson cloaks billow through the columns and down through legs to the general, heads, hats and helmets appear in all sorts of unexpected places. I’m sure Veronese gets away with murder in terms of bodily construction at times but he covers it up so well with his sumptuous brocades, silks and armour that I can forgive him anything. The low vantage point and bluegreen sky against the buttercup yellows and scarlet pimpernel crimsons brings to mind a fanciful feeling of a worm’s eye view of a springtime alpine meadow strewn with intensely coloured flowers. On formal composition, the stepping down of the background architecture repeats the whirligig going on in the foreground, the busyness stopping suddenly with the contrast of the general’s dark arm against the light, counterpoised by Christ’s highlighted arm against the dark. All this happens at about the golden section slice of the painting with Christ’s left hand on a level with the Centurion’s head. So the centre of the drama is actually a relatively empty space, the meeting of two worlds in the soldier and the bringer of peace. And in the middle is a man walking his dog! I’m still not sure what that’s about.. I visited the Prado for the first time this summer and my life long affair with Italians was blown out of the water when first coming face to face with Velasquez. That’s a whole other story to tell, but one thing that struck me forcibly was how similar some of his spatial arrangements are to Veronese, for example ‘The Surrender at Breda’ could almost be Veronese’s battle painting. Wondering around I discovered several Veronese paintings that had been bought back to Spain by Velasquez from his Italian travels for his own collection. I’m starting to veer off topic but just one more thing on my painting, the way the man handles paint. He does it with a confidence, almost a swagger that to me is completely virtuoso. Its intoxicating nearly five hundred years on, the effect on a contemporary viewer must have been astounding. Here almost for the first time (I’m lumping him together with Titian and Tintoretto here) is a painter showing his love for the stuff of paint as well as all other sumptuous stuff he surrounds himself with.